Our extensive range of Pharmaceutical medicines offers Zoladex Injections, Xgeva , Votrient Tablets, Getinifib Tablets, Tysabri Injection, Tykerb Tablets, Imipenem Tablets, Veenat Capsules, Trastuzumab, Meronem Injection to name a few. 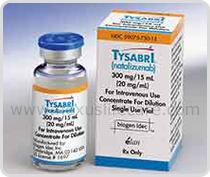 Uses:- Tysabri 300mg injection is a monoclonal antibody that affects the actions of the body's immune system. Monoclonal antibodies are made to target and destroy only certain cells in the body. This may help to protect healthy cells from damage. Tysabri injection is used to treat relapsing forms ofmultiple sclerosis.Tysabri 300mg injection is also used to treat moderate to severe Crohn's disease in adults. It is usually given after other Crohn's disease medications have been tried without successful treatment of this condition. Side Effects:- headache, tired feeling, nausea, diarrhea, stomach pain, fever, chills, cough with yellow or green mucus, cold symptoms such as stuffy nose, sneezing, sore throat, pain or burning when you urinate, joint pain, pain in your arms and legs or vaginal itching or discharge.